There are all kinds of rustic signs to either welcome, inspire or serve as a name plate for a cabin or cottage. I have found an assortment of great sign ideas that can be used in your rustic retreat. You can even make a sign of your own quite easily. Since I needed to make a sign to put at the entry of our lake road, I thought I would make it unique. There is one big tree where all of the cabin owners have placed some sort of name sign to identify their cabin as being on the lake. It is definitely not a fancy assortment. A couple of the signs are handpainted and artistic but the rest are merely a slab of wood or even a saw with a name roughly painted on. I didn’t need to go all out to make a sign. While shopping at an antique and collectible store, my husband found a broken oar. This is exactly the type of thing we needed to make a rustic sign and have it be somewhat fun and whimsical. Instead of painting our name onto the oar, I decided to use birch branches. This was a real easy way to make block letters that would stand out and have a rustic theme. I used a thick layer of E6000 craft glue to adhere the branches to the oar, which provides a nice strong bond. This glue also holds up in any kind of weather. For a little extra embellishment, I added a rusty tin deer. Finally, I coated the whole thing with a marine grade polyurethane to protect from weather. 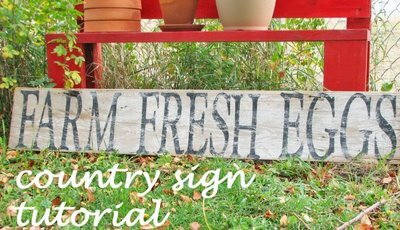 I like this tutorial by Vanessa Christenson for making a country sign. You can create your own sign and make it look weathered and old with her technique. In fact, I have some barn wood pieces laying around that would be perfect for this. There is something about stone and slate that just adds a rustic elegance. 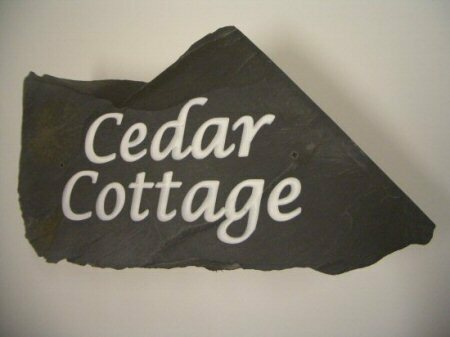 I love the look of the rustic house plaque signs by Rustic Stone. This would look great adhered to the front of a cabin or cottage. It gives a little hint to the rustic elegance that probably awaits inside. You can make your own with an electric engraver using a diamond tip. Just stencil your name on a flat rock with chalk and then engrave over your stencil. Add a little paint to your engraved name, in a contrasting color, to make it really stand out. Another great look are the hand carved wood signs. There are many to choose from at Rustic Wood Signs. I really like this one for a fishing camp. They even have great signs for a camper that are cut out in the shape of a camper. I love all of the fun personalization that you can have done with wood carving.